Our motivation is to help you to focus on the essential: your research. Having worked and graduated in basic research, we know the small and time-consuming struggles which pop up in the lab every day. 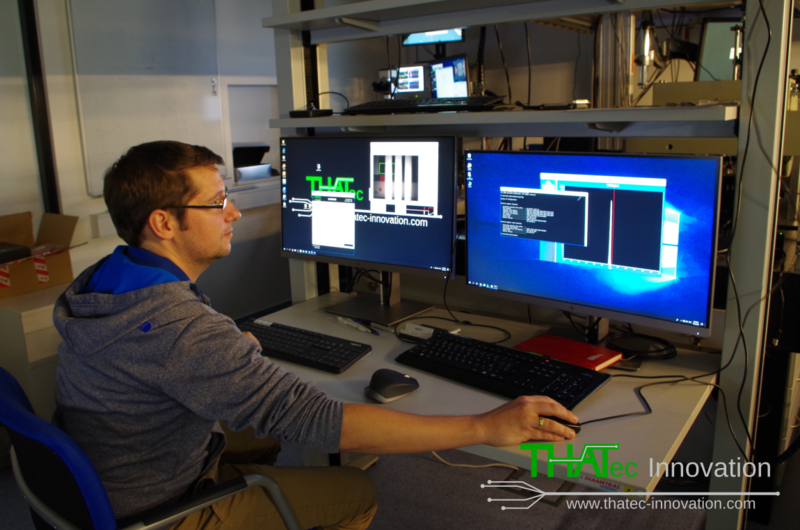 To help you to concentrate on your scientific tasks, THATec Innovation offers software and hardware solutions to move your lab to the next level. Final preparations for the spring meeting of the German physical society (DPG) in Regensburg. Learn more about our lab solutions and visit our stand at the industry fair (stand 25, LH Wirtschaft/Recht). We have moved to our new office in Mannheim, Germany! More space for creativity, prototyping and playing around with new ideas to move your lab to the next level! 11.03.2019: Visit us at the DPG spring meeting! Three weeks to go until the next spring meeting for solid state physics of the German physical society (DPG) in Regensburg, Germany. Visit our stand at the industry fair (stand 25, LH Wirtschaft/Recht) and learn more about our lab solutions. 05.03.2019: Interested in Optical Scanning Microscopy? New results were published with Dr. Thomas Sebastian from THATec Innovation as co-author! We are happy that we could help to realize these measurements! 20.02.2019: Let the prototyping begin! With our new 3D-printer, the further development and optimization of our optical scanning microscope is on the next level! The next setup to be installed, a fully automated five-wavelength scanning raman microscope, will be better than ever! One week to go until the 2nd Workshop on Brillouin microscopy of the BioBrillouin network held in Lyon, France! We are happy to show you the basics of Brillouin light scattering microscopy during the practical lessons. 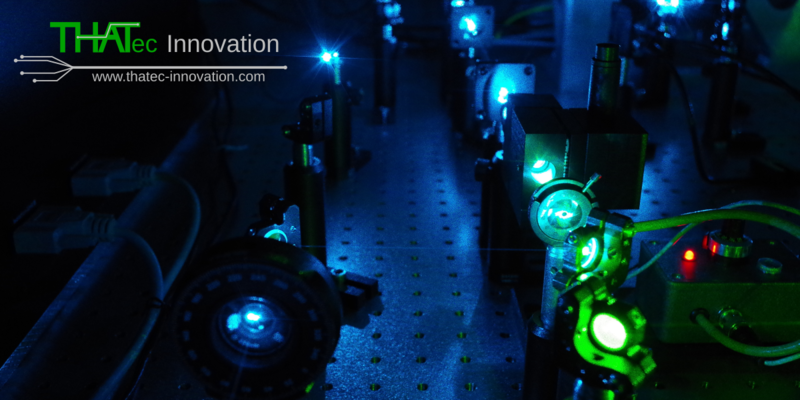 Using our software modules, we will also help you to perform fully automated Brillouin light scattering measurements! Download the DEMO Version of thaTEC:OS and the quick start guide from our Download section and get started! Manage your software modules and keep them you up to date! With our new software thaTEC:core, you get one central program to manage all software modules in your lab. Download new modules from our server, add your own modules and keep everything up to date! Your lab PCs are not online? No problem: Set up a server in your network which synchronizes with our device library or simply download our library to a USB stick and update your software manually. We wish you nice holidays and all the best for 2019! You want to use multiple wavelengths for your Raman microscope or you want a blue laser to increase the signal from spin-waves in YIG without re-aligning the optics every time you switch lasers? 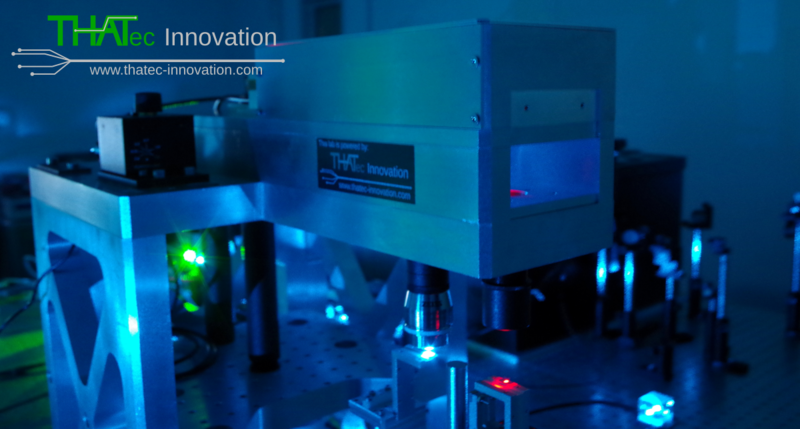 How about adding some other wavelengths to your optical scanningmicroscope and switch laser-wavelengths to your needs? No problem, just get in touch with us and bring some color to your lab! 22.11.2018: A new model of our optical scanning microscope is ready for research! Two exciting and successful weeks at the University of Delaware are about to end. Setting up a new model of our optical scanning microscope for Brillouin light scattering in Newark, visiting the liberty bell in Philadelphia, watching a game of the Blue Hens and now preparing dinner for thanksgiving - a perfect end for our visit! 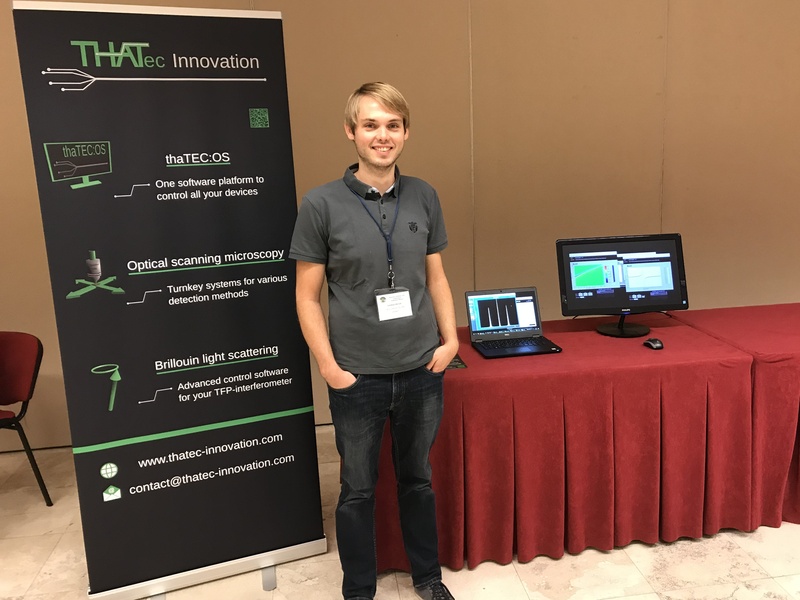 We are happy to announce that we are a sponsor of the 2nd Workshop on Brillouin microscopy held on January 2019, 23rd to 25th in Lyon, France! During the practical lessons, Dr. Thomas Sebastian and Dr. Thomas Meyer will be trainers and help you to perform automated measurements using our software modules. Thus, you will be able to use and experience our software in a real scenario! We have successfully set up a new optical scanning microscope for Brillouin light scattering at Ceitec in Brno, Czech Republic. Thank you guys for your hospitality, it has been a pleasure working with you! 26.09.2018: The idea behind our company was born in the lab! We would like to thank again the organizers and all participants of the Advances in Brillouin Light Scattering & BioBrillouin Meeting in Perugia, Italy. In particular, the insights into the use of Brillouin light scattering in biology and medical applications were very fascinating. It has been a pleasure to be a sponsor of this event and we thank you for your interest in our products and all the fruitful discussions. We hope to see all of you again soon!